A company that creates custom virtual reality applications is entering the education space. Currently, VictoryVR is developing virtual reality science books compliant with Next Generation Science Standards. That middle school curriculum will be completed by August 2017. A high school suite is expected before the end of the year. The VR programs work with Oculus Rift and Samsung VR Gear headsets as well as Apple iPhones. Each VR "book" incorporates virtual field trips, interactive games and learning activities, a "theater" experience, a teacher demo of an experiment and access to online assessments. Each grade will have six books, for a total of 24 books in the library for grades 5 through 8. Each book covers a unit. For example, "Forces in Motion" covers Newton's laws and his six simple machines, and "Engineering Design" covers the scientific process and the engineering design process. A three-year license is $5,000, which covers all computers and all students in a school building; the per-building price drops as the number of buildings rises. The fee includes all updates and access to the company's cloud-based administration system, where teachers assign pin codes to students and track their progress. 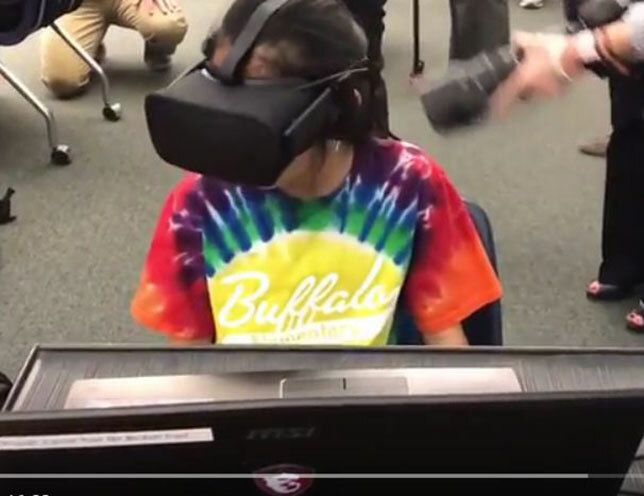 The technology has been tested at Buffalo Elementary School in Iowa, which has access to three Oculus Rift headsets, computers and the VictoryVR school curriculum, funded by a grant from the Bechtel Trust. "By experiencing our VR environments, students are actively engaged, captivated and excited to learn," said the company in a prepared statement. "Imagining their futures by experiencing the world outside of their local communities is only a headset away."